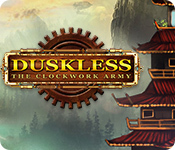 Duskless: The Clockwork Army is rated 3.0 out of 5 by 14. Rated 5 out of 5 by raydog from I am enjoying this game! I really liked the storyline and graphics - very steampunk like Pennmom said. I love the weird city I am building. I agree again with Pennmom when I too, was surprised that making matches of 7 or so did not yield a power up so you are on your own with the ones they give you. The annoying spiders are back but I am ready for them. I already purchased this game and will, of course, play it to the end. I love a match 3 and have played Clearit 4 enough times to make my head hurt. I also like the different things that have to get to the bottom also. That always brings another layer to the game! Rated 4 out of 5 by dgeehring from Surprised at any negative reviews I love match 3 games and this one was one of the best I've played in a long time. I like the game play, the story, the power up options. Like any match 3 if you play to long in one sitting it can get a little tedious but I thought it was fun. I bought it. My husband, who doesn't usually play match 3 did play this one and said he thought it was fun too. He finished it. Rated 4 out of 5 by JeansLady1 from Horrible voice overs for the most part I downloaded the trial version and purchased the game at the end of the trial, so I can't complain too much about it. The graphics are terrific. I like everything about how the game is set up, but it has some of the worst voice overs ever. They are so phony sounding for the most part. One or two of the characters sound fine, but the bad ones make me want to turn the sound off. It sounds like they use just a few people to voice multiple characters. The voices are familiar from other games. Most things are made to sound soooooo dramatic instead of realistic in tone. But I decided not to let that one glaring irritation deter me from an otherwise good game that I enjoy playing. I wasn't going to write a review on this game, but when another reviewer mentioned the voice overs, I decided to support that observation. Rated 4 out of 5 by jkuci from Interesting story and great graphics The game play was a bit sticky on my computer (HP) but it was otherwise quite fun. Its my favorite swap M3 and has a timed and untimed option. I always play timed and the game had enough challenge so that you feel a bit happy about getting over a level. Because of the sticky play I will wait to buy it when there is a sale. I really liked the graphics. Rated 4 out of 5 by pennmom36 from STEAMPUNK SEEMS TO BE THIS MONTH'S THEME? I really didn't like the first few levels of this game and I nearly gave up on it by the time level 4 rolled around. After the tutorial was over some of the levels became quite challenging to complete with all 3 Stars because of the grid configurations which were well thought out strategically. I was rather annoyed by the voiceovers and the constant pop-ups congratulating me for making matches of 4 or more, which actually kept me from making consecutive matches quickly if the pop-up occurred in the area I was trying to make matches at. Otherwise, I would have loved this game, but if you own any of the Match 3 games by e-FunSoft, there's no real change other than the graphics and the storyline. This is a swap type, Match 3 game that requires you swap two adjacent elements to create a group of at least three tiles. You can opt to play in a Relaxed, untimed mode and there is a High Scores Leaderboard. 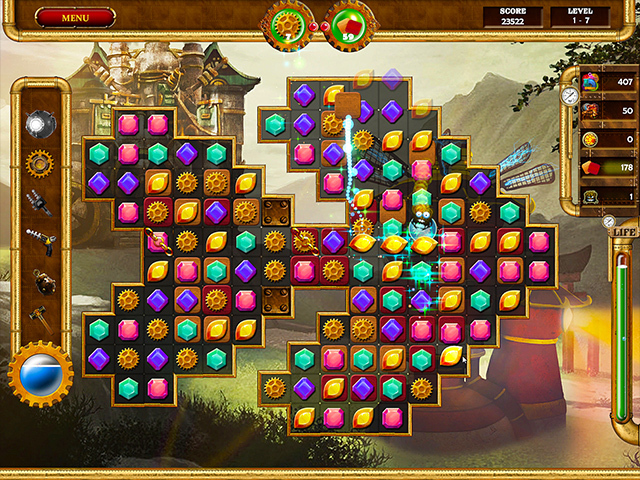 The goal of each level is to make matches over all of the Brown filled-in Cells as well as matching a specified number of specific Tiles, some levels also require you to collect Energy Orbs by dropping them to the bottom of the board. 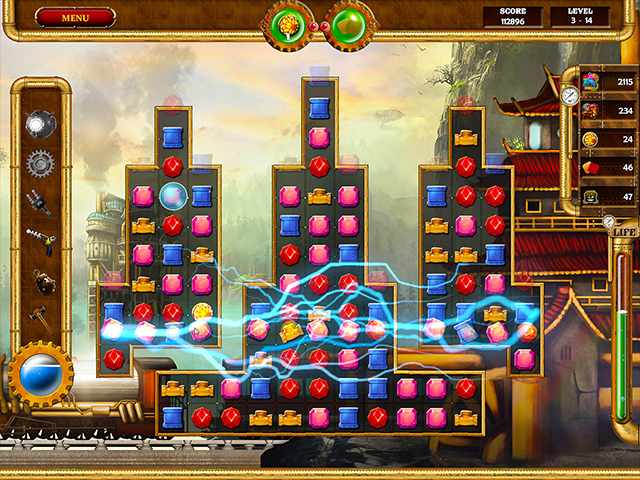 You don't earn Power-ups for making Large Matches, however, every match you make fills the Energy Orb which charges and allows you to use Bonuses such as a Hammer which removes a single tile or chain, an Energy Capsule to absorb a small group of tiles or chains, a Magnet that collects all tiles of the same kind, a Lightning Gun that clears an entire Horizontal Line including chained tiles, a Handheld Generator that clears an entire Vertical line including chains, or a Bomb which clears a large group of tiles and any chains on them. There are the normal obstructions as found in most Match 3 games of chained tiles, double chained tiles, Spiders that spin webs to lock tiles if you don't make matches under them quickly enough, but nothing unusual or different than most Match 3 games. You can purchase upgrades to rebuild the city after gathering enough resources (a star will alert you that you have met the requirements) and you must purchase all four upgrades to complete the chapter and open up the next Chapter's levels. I liked the challenge this game has and it was fun to play, however, I'm not seeing anything different than all other e-FunSoft Match 3 games, even the level grids seem familiar. Give the demo a try to see if you like it, but don't give up too soon, after the first few levels it does become more challenging. Rated 3 out of 5 by Quickie from Duskless Muddle While I might have enjoyed this game, the cursor movement was so jumpy and slow that I have no real desire to buy it. Visuals are beautiful, but not enough to overlook the choppiness of the cursor. Actually the cursor looked and felt very 1990's. Rated 2 out of 5 by karenmusik from Love Steampunk, but not this game I really wanted to like this game, but the match 3 element was just not fun. I play with a touch screen and the gameplay felt really slow and clunky. I would also have appreciated a bit more information on items like the value of match-ups. The story was a steampunk version of many other "evil inventor wants revenge" tales, but I liked it. The voices and graphics were pretty good, but the music was annoying. I probably would buy it except the match 3 is so frustrating to try to play. Rated 2 out of 5 by verimeri from good enough story but that is all The story line seemed interesting enough- bad guy versus good guy but that is about the only positive thing I can say. 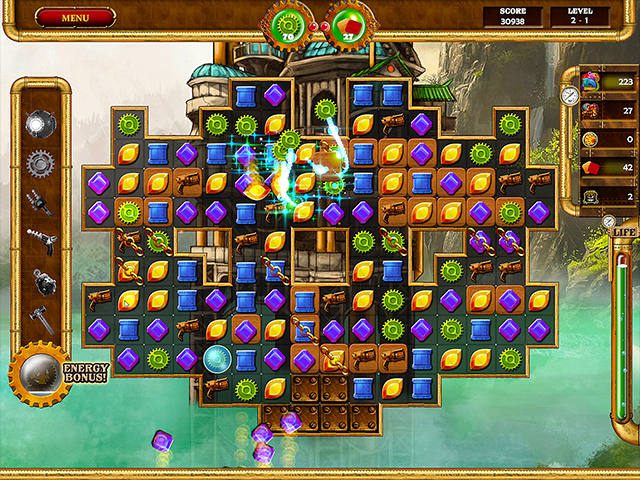 After the first few levels the boards were overwhelming. So many things locked. I could see where in future levels it could easily take 10-20 minutes to play a level. While some may enjoy the struggle to pass a level that is not for me. I far prefer games where there are on board power ups and you can create multiple matches at once. I struggled through 45 minutes and deleted the game.